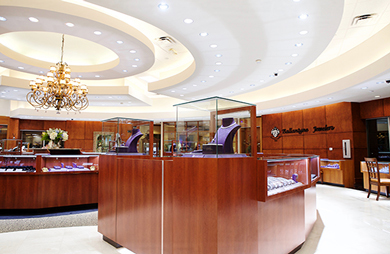 Ballantyne Jewelers has a proud and long history in the jewelry business, serving the communities of Charlotte and the surrounding areas. As a destination store, the team at Ballantyne Jewelers makes every effort to treat our guests as family. We strive to offer knowledgeable sales assistance in a friendly and truthful manner, while always offering great value and unsurpassed quality with every purchase. We offer extensive selections of loose diamonds, over 1,000 engagement rings in stock, fashion jewelry, and watches at the best prices, with the over-the-top service you deserve.